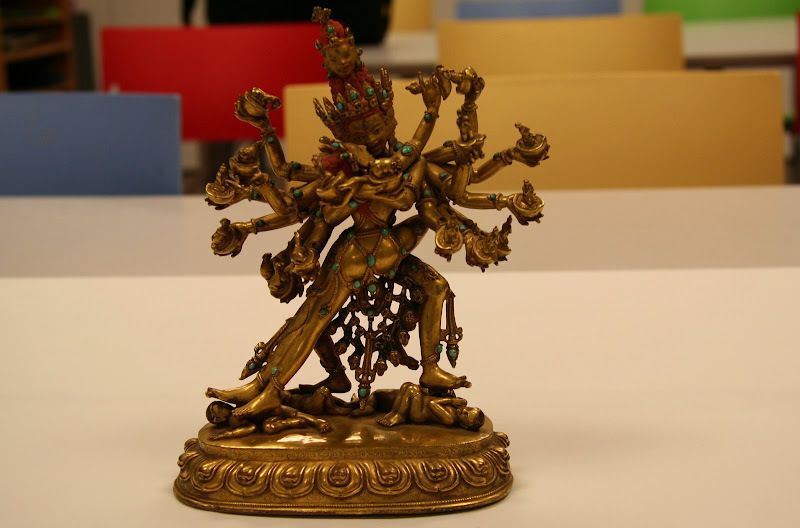 this week theme thursday is celebrating statues! I never knew how many frigging snaps of statues I have in my photo stash....I really tried to narrow it down, I swear! People like eccentrics. Therefore they will leave me alone, saying that I am a mad clown. Beings are bound by passion and are released by utilizing passion. life started when a raven flew from heaven towards the earth and found the earth covered in snow. He then stole the sun from the gods and created animals, forests, rivers and oceans. One day, on a beach, the raven found an enormous clamshell with five men in it. The raven coaxed them into leaving the shell with the promise of a prosperous life. 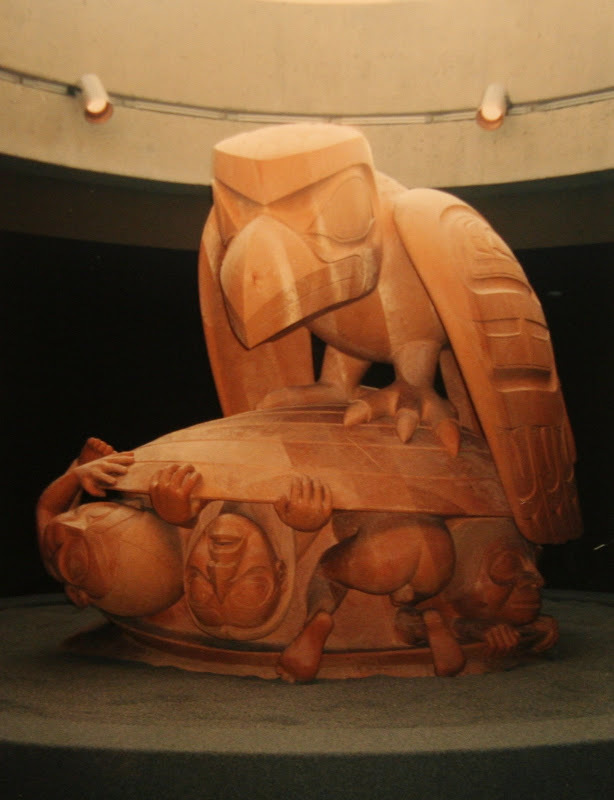 Hesitant at first, they eventually emerged from the shell, becoming the first Haida men. Eventually, the raven told them where to find women. I'm particularly pleased my brother told me about today being bob's birthday. now I have an excuse to include this photo - it was among the many photos on my desktop that went unused.... the photo was taken in october 2004 during my first trip to paris. for three years my sister and her family lived in paris, I was most fortunate to have been able to visit three times during their time there. this sculpture by polish sculptor igor mitoraj is called eros bendato (eros bound). this was one of many of mitoraj's pieces which were exhibited in the jardin des tuileries that fall. his work is amazing - although it is rooted in a classical tradition, it has a very post-modern twist! 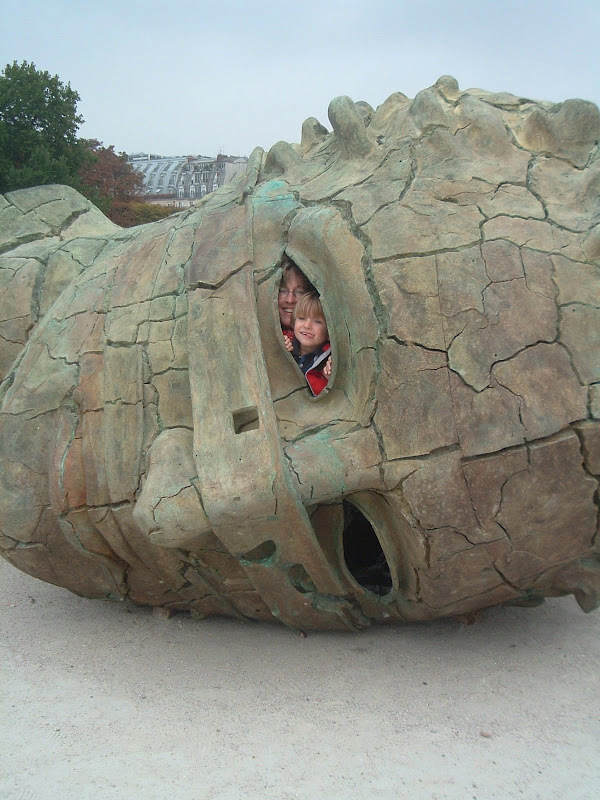 (by the way, that is my sister and her son inside the eye). 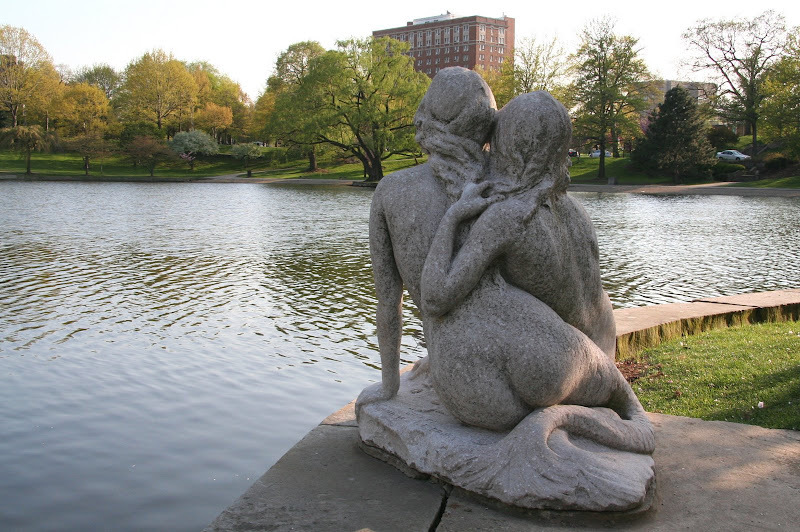 Really enjoyed this photo essay-- the Hirschorn sculpture garden was a favorite DC spot of mine when I lived in Virginia, roughly 2 hours south of DC; don't remember that sculpture, but perhaps it wasn't there 20 years ago (yikes-- has it really been that long. & those Cleveland rat statues are amazing. A great quilt you've made, with your images and quotes. I notice many similar themes and images, too. Happy Theme Thursday! Your posts are just so nice to look at and to read. what a nice variety of sculptures & the quotes with them are perfect. the raven legend is a bonus- they have been showing up in my art lately and i was planning to look it up... happy thursday! Nice collection, Kim! And I love it that you included Raven. I have him tattooed on my left shoulder as Raven/Crow is one of my totems. Another Trickster who created something (in this case humans) against the advice of the other gods. Gotta love those tricksters! Dennis finds the rat interesting. Fabulous photos with perfect quotes. john - depending exactly on when you were there, that statue probably wasn't there - flanagan cast it in '89-90, but I don't know when the hirschore acquired it. I go to d.c. fairly frequently and try and make a point of visiting the sculpture garden if I'm anywhere near the mall. I too love the rat statues, as you might have guessed I do have a special fondness of all things rodent! love - thank you so much....that is so lovely to hear! marianne - I have long been drawn to the raven...such a powerful (and yes often tricky) figure in lore and myth. not only in north america, but the celts, the scandanavians, and even in asia...how wonderful that they are visiting your art these days. dennis - I'm sure the rat would in turn find you quite interesting too! dd - thank you....it was so hard to choose - I had a dozen paris statues on my desktop....and had to narrow it down...like so many places in europe bursting with interesting statues - and not just in museums. I started following your blog when it was featured on B-O-N a couple of weeks ago and I absolutely admire it. I especially love TT, Theme Thursday. Your photographs are amazing and the quotes match them perfectly. Your blog, and some of your followers blog, have really inspired me to be a little more creative with my blog. Thanks for posting and have a great day! wow. I was already loving the selection, then I got to the last one and, well... you got the wow word out of me. Great stuff, petite souris. Enjoyed the photos and quotes. Very nice. I think my favorite sculpture might be the Drummer. That was lovely, thanks Mouse! As always, so hard to pick a favorite. But you know, why should I have to pick a favorite?? They're all wonderful!! Thanks-- that explains it-- I moved to San Francisco in 1989, so there's no way I saw it-- haven't been to DC since, tho I was in Charlottesville, VA for a few days in the mid 90s. Thanks for the info. What a wonderful vision quest of statues and stories and quotes and bits and bobs! I must say some of the best statue pictures I have ever seen. Loved the quotes as well! Glad I found theme thursday...so many wonderful and creative blogs! you say you wanna visit greece and I say...I REALLY wanna visit America. Who knows one day maybe we will both get our wishes granted! Wow! I'm always amazed at what you are able to pull out of your photo archives. Great job! How many gigs of photos must you have? ! I like them all, but I can see looking out of the eyes of that last one! Was hoping it was in your neighborhood! Your letter for the word game is K. I put up another more fascinating post for Theme Thursday on my Blog. Check it out and thanks for your visits. I love all your photos! All good, but that last is just fabulous. Isn't it great to be able to get inside art & become a part of it? Takes you a step further from just observing. can only write 'wow' - great posts, literature, great references to great people. i love Marley too. i easily lose in his work, easily. I like them all, but that second one is particularly striking! Absolutely love the huge head with two faces staring out the eye socket ... and Rodin's Gates of Hell, always on the top of any sculpture list for me. The Rat will definitely draw pedestrian attention won't it? I have to agree with Betty-- art you can get insdie of! fabulous! I have to say both the Nijinsky photo and quote are my favorite. Do you stockpile quotes for times such as these? I love the out of scale things in particular, especially the head. You chose well. I was wondering if you were going to include any of the photos from the class trip you took with us to The Metropolitan Museum of Art. If I had gotten myself together beforehand I might have done that myself. I thought that was you in the eye on that last picture. Your sister resembles you. i like the rabbit and the grave and i like the raven, and the last one with people in it. wow - so many comments. tt is rocking this week with so many playing - thanks megan for setting up the tt blog!!!! ca - bless is a wonderful wv!!! betty - a lot of sculpture does just seem to call out for us to get 'personal' with it!! kris - ah another rabbit lover...and you from down-under and all???? dot-com - come on back anytime!! Mouse, this post was spectacular! Oh! You have a pic of my Haida friend Raven. Very cool. Actually they're all cool. I love cemetery statuary, too. Nijinsky's grave ! Amazing! Another reason for me to visit Paris.........I,m ashamed to say,I,ve never been although it's just an hour's plane journey away from Me! Thank You for all the Statues & the Whole Theme Thursday concept.Regards Tony. Great spread for statue day! Your photos are superb, and the quotes well matched. I like.